As you all knows that Pinterest is a Virtual Pinboard that lets you organize and share all the beautiful things you find on the web. People use pinboards to plan their weddings, decorate their homes, and organize their favourite recipes. Best of all, you can browse pinboards created by other people. Browsing pinboards is a fun way to discover new things and get inspiration from people who share your interests. There's a fact that images which are pinned are always shown ahead at the search engines, so we must pin it! To make it easy today i am going to tell you an awesome WordPress plugin named a Pinterest Plugin which shows the "Pin It" button on top of your images, only when people move their mouse over the image. About Pinterest Plugin- How it helps in boosting your site Traffic? 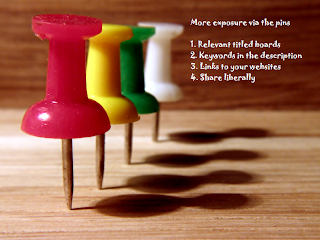 This plugin doesn't display the Pinterest "Pin It" button underneath your blog post like a few other plugins out there. Instead it shows the "Pin It" button on top of the image itself, when your readers move their mouse over the image. This makes it easier for your readers to select exactly which image they want to pin. The plugin also sends your image alt text to Pinterest as default 'Description.' Pinterest sends more traffic than Youtube, Linkedin, Google+, Reddit and other social websites. That is why, if you want to attract traffic from Pinterest, you should install this plugin to your blog. How to Get started with Pinterest Plugin? 1. First of all download the plugin from here. 2. Now upload and install it from your WordPress Dashboard. 3. After installing, activate the plugin and get go!